Additional Information/14,000 Phillies Commentary: Seeded in packs of 2012 Leaf Memories. Cards are autographed buybacks of 1990 Leaf cards and bear a serial number on the lower-right front corner of the card. According to Leaf’s marketing material, the cards are serial-numbered to the player’s uniform number — in the checklist below, the print run for each card is listed in parenthesis after the player’s name. However, they didn’t look to closely at the photo on the card before determining what uniform number that should be. Thon, for instance, is wearing #21 in the photo on his card, but he only signed 10 of his cards. 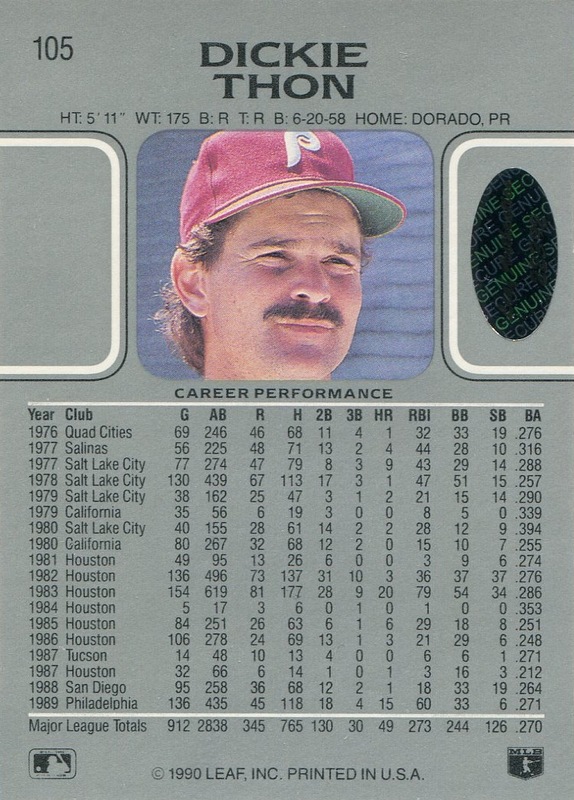 Admittedly, he did wear #10 while with the Astros and Rangers, but it really would have behooved Leaf to get the number right based on what the card itself shows. It was disappointing to discover that there were just two Phillies represented in this release. 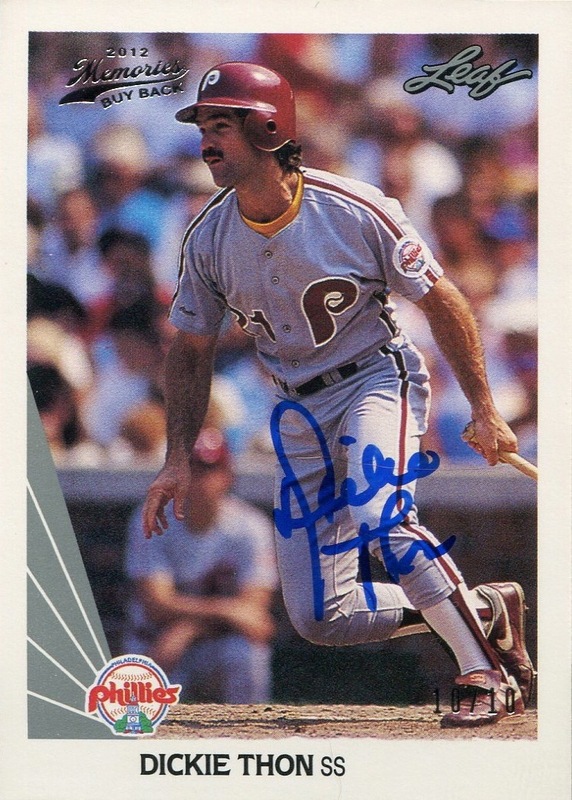 However, the fact that neither McDowell nor Thon had previously appeared on an autograph issue as a Phillie helped ameliorate that disappointment. Given the ultra-low print runs and the fact that I was unaware of these cards for a couple months after they appeared on the market (a direct result of my decision to pay very little attention to non-licensed issues), I was happy to just get the Thon autograph shown above. However, I will continue to keep an eye open on eBay for one of the McDowell cards. I like the fact that Leaf applied holograms to the back of these cards. While the current iteration of Leaf is not related in any way to Playoff/Donruss, it slightly bothered me that the Donruss Recollection Collection autographs bore very little additional embellishment. I will need to make sure to pay better attention to similar future releases from Leaf.